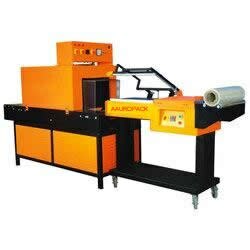 Shrink L-Sealer Machines It is Suitable for Small Bags Packing And Adopts Electronic Constant temp. control System and variable speed adjusting transmission mechanism . it can be fixed to it as well . Specification: 1.Sealing Width - 08 mm to 10 mm , 2.Models available – Horizontal & Vertical , 3.Temperature - 0-300 C., 4.Speed- - 0-12mtr. 5.Min.,Power Supply – Single Phase 230 V.